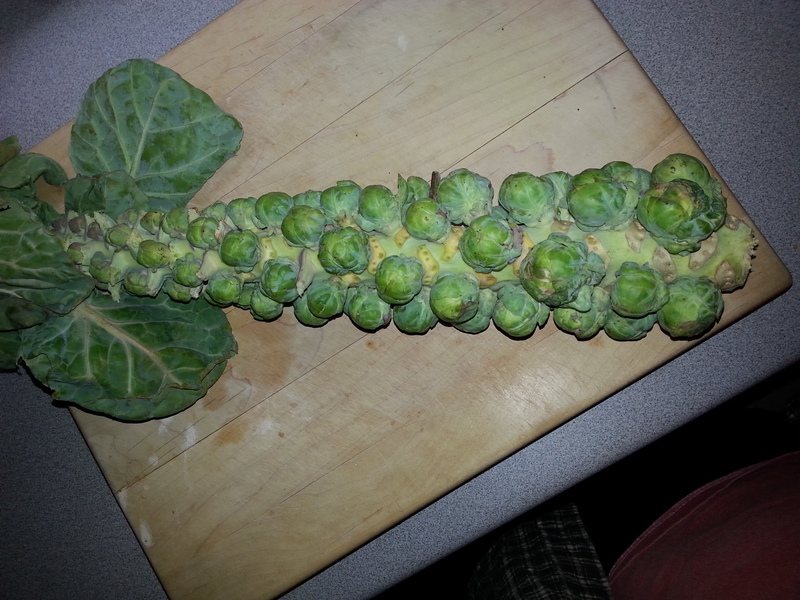 Comments Off on The only Brussel Sprouts I’ve ever enjoyed! The only Brussel Sprouts I’ve ever enjoyed! We’ve been meaning to share this amazing recipe from Eben Erhard ever since he unexpectedly showed up on our door step one winter in December with a sample. 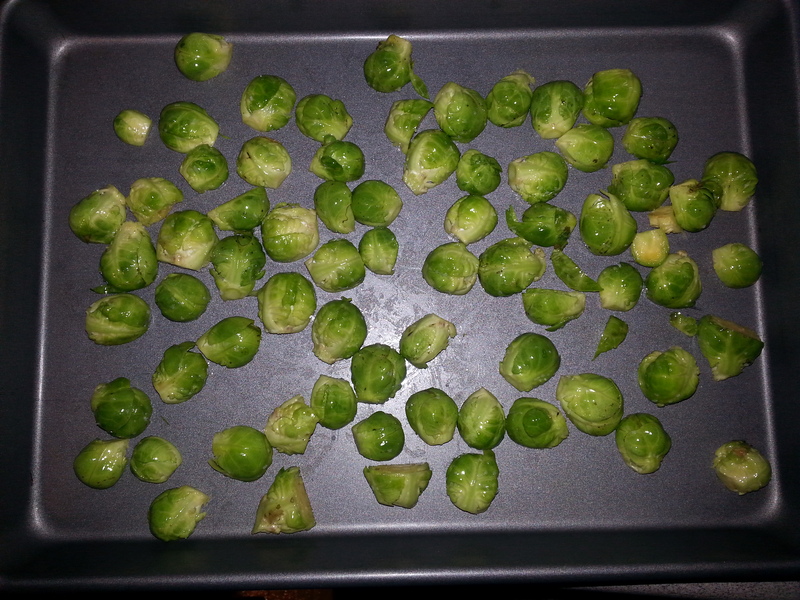 Truly the only Brussel Sprouts I’ve ever enjoyed. If you don’t know Eben, he is the husband of our trainer Lori. “On a whim for Thanksgiving I decided that along with the standard boring side dishes, I should add something healthy to the menu and what’s not to love about Brussels sprouts? Lots, according to some people I guess, but I was not to be deterred. What I came up with seemed to be more than palatable. I hope you will agree. 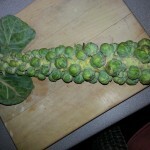 1 – 2 cups of Brussels sprouts, halved or quartered depending on size. 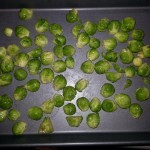 Shake the Brussels sprouts in a sealed container with enough olive oil to coat and a scant ½ teaspoon of salt. Place on cookie sheet or other backing pan and roast in the oven at 350 degrees for 20 minutes. 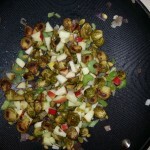 While the sprouts are roasting chop up the onion, celery and apples into ¼ to ½ inch pieces. After the sprouts have been in the oven for 15 minutes, caramelize the onions with some olive oil over medium high heat. 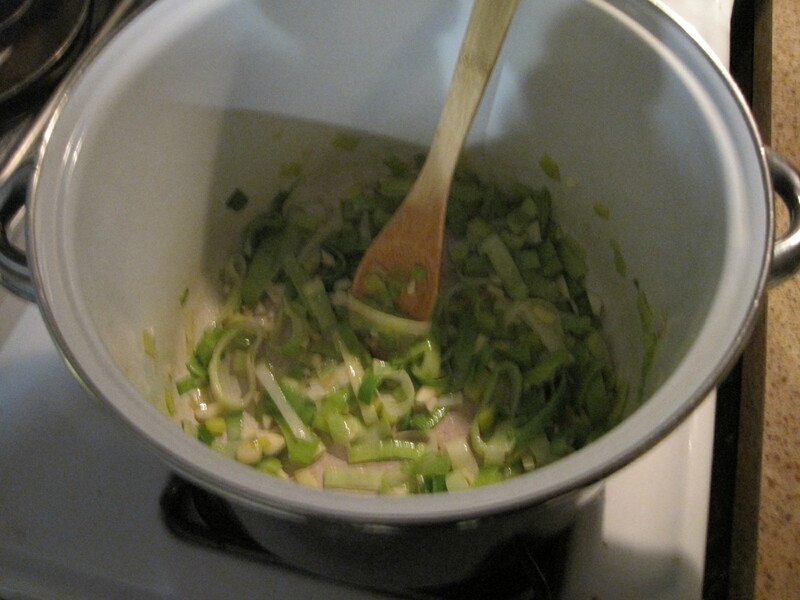 After about 1-2 minutes add the celery. Cook until the onions have a nice translucent quality stirring often. 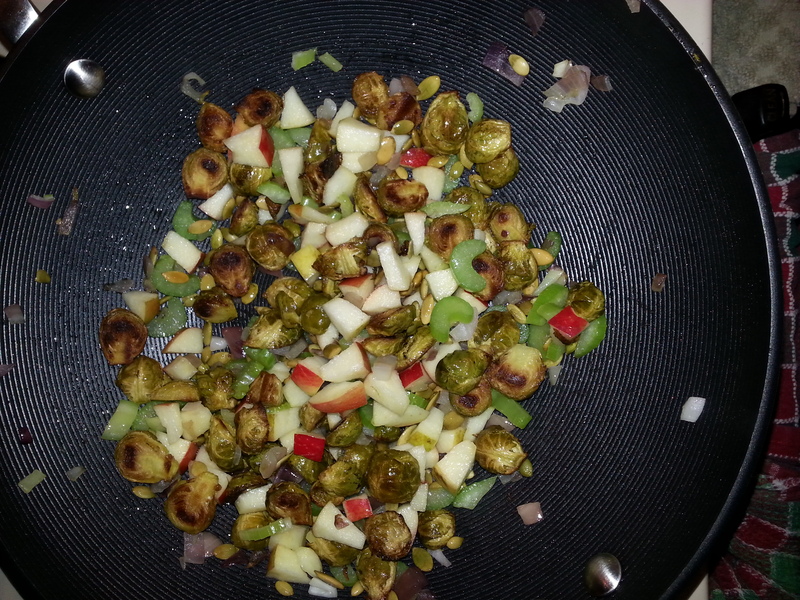 Add Brussels sprouts, apples and pepitas and cook for a minute or so until the chill is taken off the apples and you are ready to serve. Nutrition Analysis: Makes 3 servings. 175 calories/serving including 6g protein, 16g carbs, 10g fat, and 4 g of fiber. 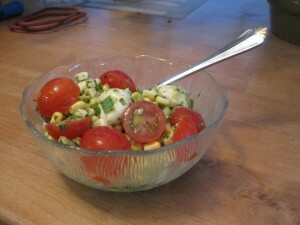 This recipe uses late summer produce (which we are still getting plenty of in September!!) including corn, tomatoes and basil. This a colorful and tasty side dish…perfect to bring as a “dish-to-pass” next time you head to a cookout! Thanks to Carla N. for the suggestion…we looked up “corn tomato recipes” online and started with a recipe, however, as usual Ryan did make some changes….hope you enjoy this! Whisk the vinegar, salt, and pepper in a small bowl. Gradually whisk in the oil, starting with a few drops and then adding the rest in a steady stream, to make a smooth dressing. Shear off the corn kernels with a sharp knife over a bowl. 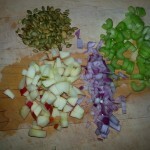 Toss in the tomatoes, scallions, and mozzarella. Pour the vinaigrette over the salad and toss to coat. Cover and let set for 15 minutes or up to 2 hours. Before serving chop the basil and stir it into the salad. 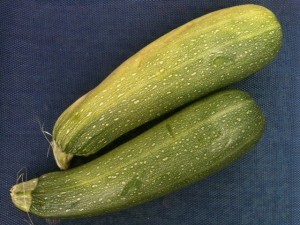 The zucchinis are still in abundance, so here’s another delicious recipe using our favorite summer squash! 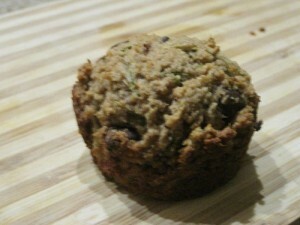 Thanks to Gini M. for the recipe from her cookbook, “Grain-Free Gourmet” and introducing us to almond flour. 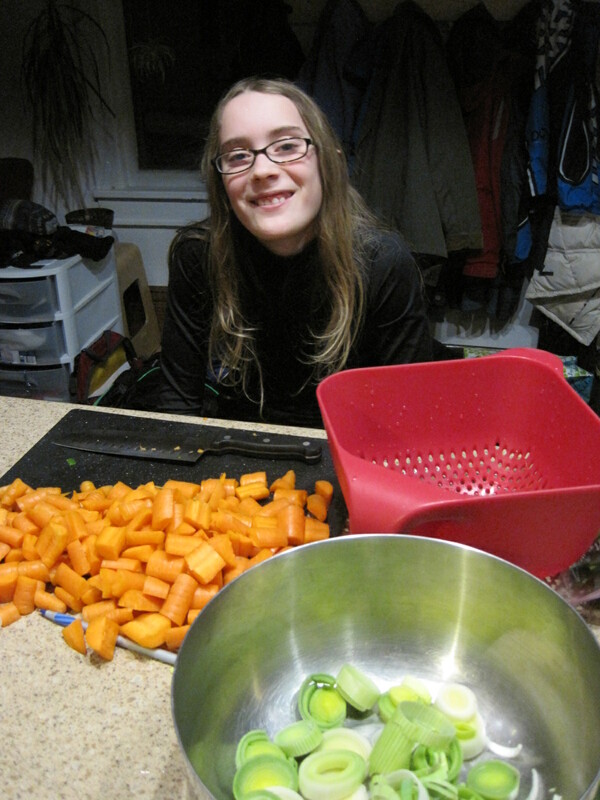 Thanks to Jennifer for the zucchini AND thanks to Jasmine for grating the zucchini!! Note that this is not a low calorie food but is gluten and grain free. 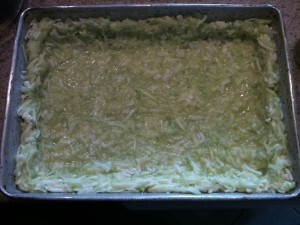 2) peel and grate zucchini. Place in middle of dish towel; gather sides and wring out as much liquid as you can. Set aside. 3) in a large mixing bowl, combine the almond flour, cinnamon, baking soda and salt. 4) in another bowl, combine the eggs, oil, honey, vanilla, cider vinegar. Then add the grated zucchini & chocolate chips (optional) to this mixture. 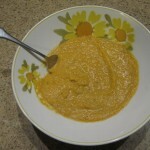 5) add the wet ingredients t0 the dry ingredients and stir until well-combined. 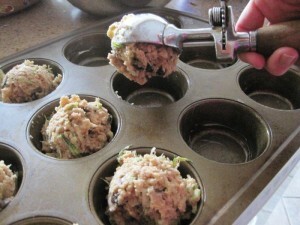 6) For muffins, evenly fill each baking cup with the batter. We like to use an ice cream scoop. Bake for 30 minutes & check (the cookbook called for 50 minutes which seemed like way too much time and I am glad I did not leave them in that long) They are done when the top springs back when lightly touched. For a loaf, scoop the batter into a greased loaf pan and bake for 60 minutes or until top springs back when lightly touched. Note about the nutrition facts: Almond flour is a VERY dense food and is helpful for anyone avoiding grains or gluten. When you eat one of these muffins you will very satisfied for a long time due in part to having 21% of your daily fiber (2000 calorie diet) and a high but healthy fat content. Have we mentioned that fat doesn’t make you fat? It’s the removal of fat from carbohydrates that drives your hunger? So with that little disclaimer, here’s your nutrition facts! 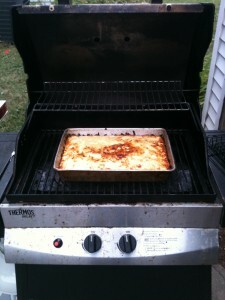 So it turns out that real men not only eat quiche, they make it on the grill! The idea of baking things in my kitchen while the air conditioning is running is just unthinkable so I resorted to using the grill as my oven and it worked reasonably well. Previously this summer I’ve baked lasagna and boiled a few dinners. It’s my summer kitchen. 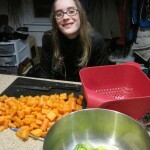 This week’s Friday Foodie is Gini M. who introduced me to the recipe I adapted from Grain-Free Gourmet authors Jodi Bager and Jenny Lass. Thanks also to our business manager, Jennifer, who supplied the monster zucchini and Grandma Zuehlke from whom I inherited the 9×13 aluminum pan that is a prized possession in our kitchen. I doubled the quantities to make a 9×13″ pan to ensure leftovers for lunches. This is not a ‘low calorie’ nor a ‘low fat’ recipe, however it is extremely satisfying and is a Low Carb Meal for our VEMMA carb-cycling clients . 2. Grate a Wisconsin-sized zucchini, then use a towel to squeeze all the excess water out of it to get about 4 cups of shredded Zucchini. 3. Mix shredded zucchini with 2 eggs and 1 cup Parmesan or Mozzarella cheese. 5. 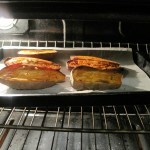 Bake the crust for 20-30 minutes until cooked through and the edges are browned. 1. Make the batter: Mix together 8 eggs, 2 cups of plain yogurt, 3/4 teaspoon salt, 1/4 teaspoon each of nutmeg, cayenne and black pepper. 2. 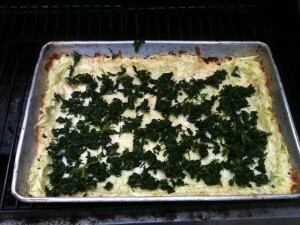 Distribute the chopped spinach on top of the cooked zucchini crust. 3. Layer the cheeses on top. 4. Pour the batter on top. 5. Turn up the grill to medium high (oven to 450′) and bake for 10 minutes. 6. 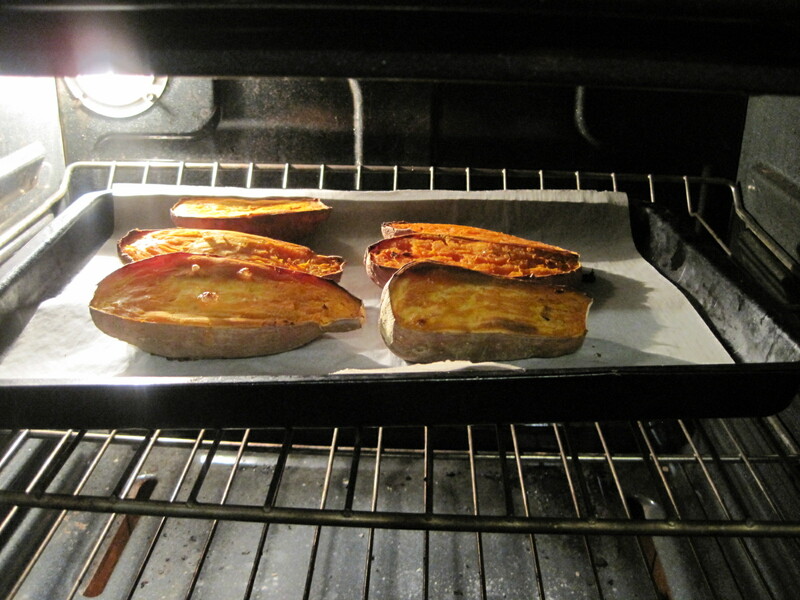 Reduce the grill to low (oven to 350′) and bake 20-30 minutes. 7. Remove from the grill/oven when a knife inserted into the center comes out clean. We invite you to check out one of our Smart Loss Programs to learn all about Carb-Cycling! The basic idea is that you alternate between high-carb days and low-carb days in order to rev up your metabolism. You will get a link to some great software which will help you plan your meals and incorporates recipes like the one below! 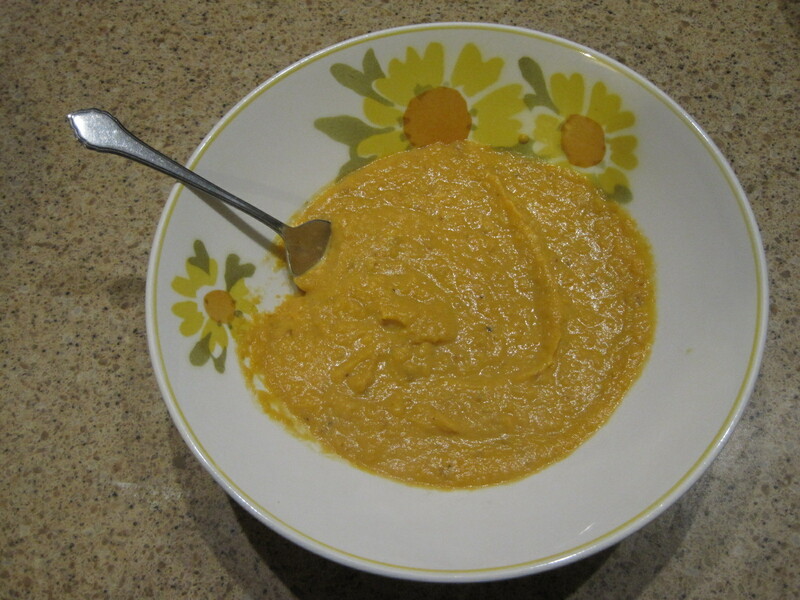 On a plate, combine cheese, oregano, paprika, salt and pepper. Lightly brush each chicken breast with a small amount of oil, then dredge chicken into the cheese mixture. In a small frying pan, melt butter and 1 teaspoon of oil together over medium-high heat. Lightly brown chicken on both sides then place in the foil lined baking pan. Bake for about 25 – 30 minutes or until chicken is thoroughly cooked. Serve with a side Caesar salad. Toss Romain lettuce, fat-free Caesar dressing and a little grated parmesan cheese together. Go easy on the dressing! It doesn’t take much! IF IT’S A HIGH CARB DAY: (or for the people in your house who aren’t carb-cycling) serve 2 whole grain bread sticks with Garlic bread seasoning. We invite you to check out one of our Smart Loss Programs to learn all about Carb-Cycling! The basic idea is that you alternate between high-carb days and low-carb days in order to rev up your metabolism. You will get a link to some great software which will help you plan your meals and incorporates recipes like the ones below! Check out the vegetarian and turkey options! Split open and toast hamburger buns. Cook Morningstar Farms(R) Grillers Prime(R) Veggie Burgers according to package directions. Immediately top each patty with cheese. Let stand about 1 minute or until cheese melts. In the meantime, in a pan, heat oil over medium heat. Add mushrooms and onion to pan. Saute until tender (3-5 minutes), stirring frequently. Place a lettuce leaf, tomato and veggie burger on each bun bottom. Top with sauteed mushrooms and onions and finish off with the bun top. Form ground turkey into two patties. In a pan, over medium-high heat, heat 1 teaspoon oil. Add turkey patties and cook on both sides until done and juices run clear. Immediately top each patty with a cheese slice. Let stand about 1 minute or until cheese melts. In the meantime, in another pan, heat remaining 1 teaspoon oil over medium heat. Place a lettuce leaf, tomato and burger on each bun bottom. Top with sauteed mushrooms and onions and finish off with the bun top. 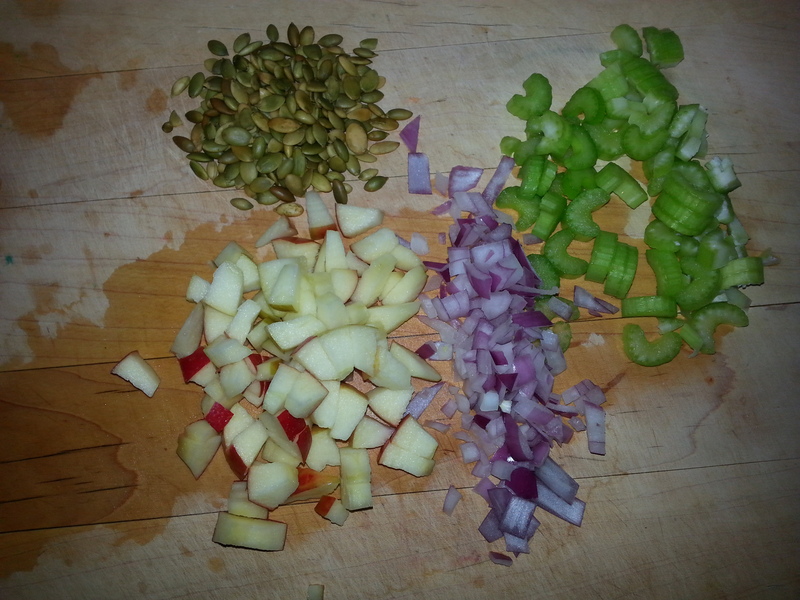 Combine spices together in a small bowl and sprinkle mix on both sides of the chops. Heat olive oil in a pan over medium heat, then add pork chops and cook on both sides until done. Remove from pan and keep warm by covering lightly with foil. Add butter to pan and use a whisk to stir browned bits. 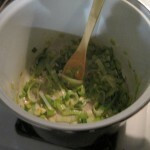 Add chicken broth and keep whisking until the sauce reduces in about half, stirring well. Serve the chops with the sauce on top and steamed broccoli. If it’s a High Carb Day for you or you have family members who are NOT eating low carb: Serve with steamed brown rice or a baked potato (remember a serving of smart carbs is the size of your fist). P.S. I am a vegetarian, so I haven’t personally tried this recipe, however my clients who have tried this one really like it!